Monday, October 18 was a good day. I dropped Tristan off at preschool and then headed off to Starbucks to meet my friend Jenn for an adult’s only coffee date. With Jenn as my witness, I put a little proposition out there for the powers that be. That evening I met up with a couple more girlfriends at the swimming pool for our weekly prenatal aquafit class. I told them of my request to the universe and we collectively wondered if I’d be back for fitness class the following week. I was home about 8:00 and by 10:00 that night, labour began! Be careful what you ask for! Not too long after getting home, I started having some mild cramping. That, along with the fact that I had to keep running to the washroom, made me wonder if perhaps labour was actually starting. To be honest, I really wasn’t sure. I had made spaghetti sauce for dinner and both Luc and I had agreed that the meat had tasted a little funny. I asked Luc if his stomach was upset at all. I figured if it was, maybe it was just the meat that was causing me discomfort! I couldn’t really argue with that so we called and Gillian picked up on the first ring. I explained what was going on and my doubts if this was the real thing or not. She asked me to drink some water and try to get a little sleep. If the contractions were too much to sleep, I was to call back. Luc fell instantly into dreamland. Try as I might, sleep was jut not going to happen for me. I started to think it wasn’t the meat afterall. I spent the next two hours sitting on the birthing ball, listening to my hypnobirthing CD, and pacing the house. Finally at 2:00 AM I woke Luc again. I could deny the inevitable no longer. “It’s time to call the doula and midwife”, I said. I hopped into the shower, which helped with the ever stronger contractions, and by 2:30 both my midwife, Maxine, and Gillian had arrived. Maxine checked the baby’s heart rate, which was perfect, and I continued on in the shower. Gillian had given me the suggestion that each contraction was a mere three breaths, and this way of thinking really helped. I would inhale deeply, right into the pit of my belly, and on the exhale release a low, deep, primal groan. Each contraction I successfully breathed through was one I’d never have to do again. Maxine offered to check how far along I was, which I declined. I was feeling really good, despite the contractions gaining strength, and did not want to be discouraged if I was only minimally dilated. I had a strong belief that both my body and my baby knew exactly what to do, so I just trusted in the natural process. Before too long I started to feel pressure and everyone began to think that perhaps this baby’s birth was imminent. I hopped into the tub and Max called in the second midwife. A couple of hours passed, but still no baby. Around 4 AM Maxine suggested that we check my progress so we could better gauge what step to take next. I agreed and was relieved to find I was six centimetres dilated. (I was scared that she would tell me I was only one, or that this whole ordeal would turn out to be the result of bad meat after all!) This meant the quickest part of labour, transition, was imminent. At 5:30 we called my dad to let him know the baby would be born soon. He arrived at 6:30 so that he would be there when Tristan woke up some time after 7:00. The baby was still floating, not making direct contact with the cervix, so Gillian suggested a way for me to help the baby move into position. In the middle of the night, I began lunging up the stairs. Luc walked with me as I lunged and swayed my hips and I would grasp onto him for support during each contraction. It sounds crazy to be in labour and lunging in the middle of the night , but I was grateful to have support and alternatives to help me achieve the intervention free birth I was hoping for. I continued to labour for the next three hours. There is a reason that this stage in a woman’s life is called labour… it’s hard work. I am grateful to have had knowledgeable and extremely supportive midwife and doula, and a caring and involved husband to help me through my labour. I felt confident and cared for and very capable of birthing my baby naturally. I had mentally prepared for this time in my life with mantras such as, “Either you are a prisoner of your mind and your fears, or you are the ruler of your mind.” Labour was totally a mind game – I had to choose how I would cope with contractions – and as long as I stayed in control of my thoughts, I was grand. I feel proud for coping so well for nine hours. There was never a time during my labour when I thought that I could not continue on, that I needed to move to the hospital for medication. I felt in control, and that is a powerful thing. At 7 am, Maxine checked me again to find that I was ten cms dilated. We decided we should break my water and those short few minutes were the most difficult of my labour. The baby was continuing to float and move around within me. During the breaking of the water, it was important for the baby’s head to be completely down to prevent the umbilical cord from being swept out before the baby. To ensure this, I had to lay on my back for an entire contraction, which in itself made the surge so much more intense. One midwife pressed her hand firmly down on my belly to press the baby downward, while the other midwife released the membranes. A very long minute indeed. “If you want,” said Maxine, “we can call an ambulance to have on stand-by but I really don’t think it’s necessary.” She explained that the fluid was still very thin and that the baby’s heart rate was exactly as it should be. With that, I went back into my head and began to push my baby out. I can easily say that birthing my baby was the single most intense experience I have ever had. I have never been so mentally or physically challenged in all my life. On hands and knees on my bed, I harnessed every ounce of strength and determination within me to get closer to meeting my baby. Maxine, the second midwife Anna Maria, Gillian and Luc were a fantastic cheering squad who helped pull me through each push. As my sweet baby was crowning, and the primal instinct was taking over which had my entire body pushing with each surge, Luc kept popping his head up near mine, face filled with excitement, to tell me that the baby was coming. And then in an instant, my body was overcome with relief as my baby was born into the world and I collapsed down onto my bed. The babe was born at 7:41 AM – thank you universe. Another boy. And his daddy’s hands were the first our precious baby would feel on this earth. Luc passed him to me and the thing I remember most about that moment was how slippery he was. It took me several tries to finally grasp him before I pulled him to my chest and relaxed back onto my pillows, feeling very accomplished and very in love. He was incredibly calm and alert and was rooting for the breast pretty much as soon as he felt his mamas arms around him. Being at home was wonderful. 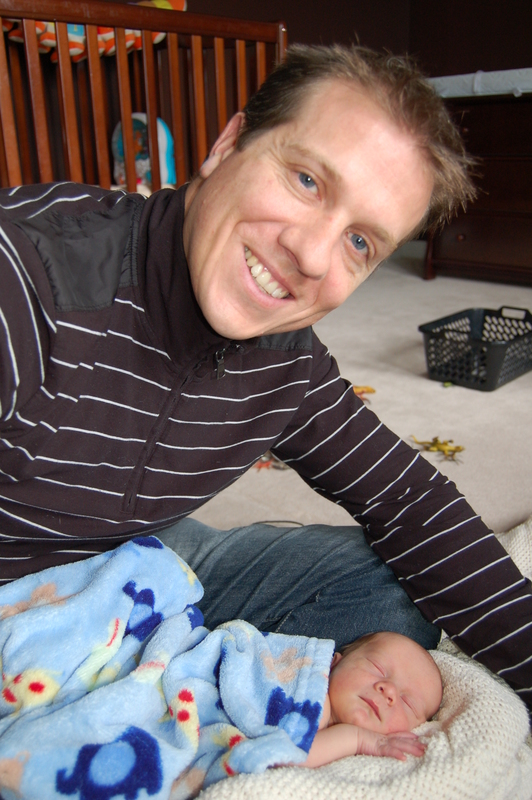 Logan (who wouldn’t receive that name for over a week) and his daddy and I laid in bed together for a few hours. Its was so great to be in our own space as we got to know each other. 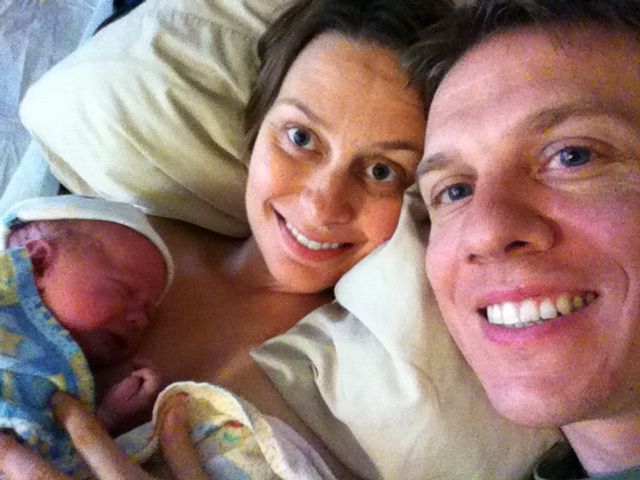 I nursed and we snuggled and I sniffed his newborn smell… and we just were. 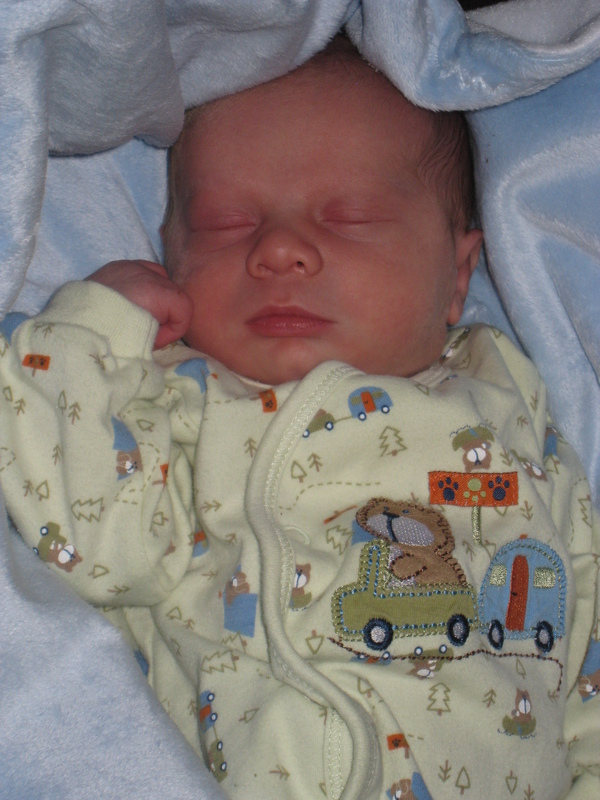 World, may I present to you, Logan, born October 19, 2010, weighing 7 lbs 5 oz! At 10:00, just over two hours since the baby made his entrance into the world, we called downstairs for grampa and Tristan to come up to meet baby Logan. Tristan has become a very good big brother, despite the first words out of his mouth being, “No daddy, I want a sister!” Sorry buddy! 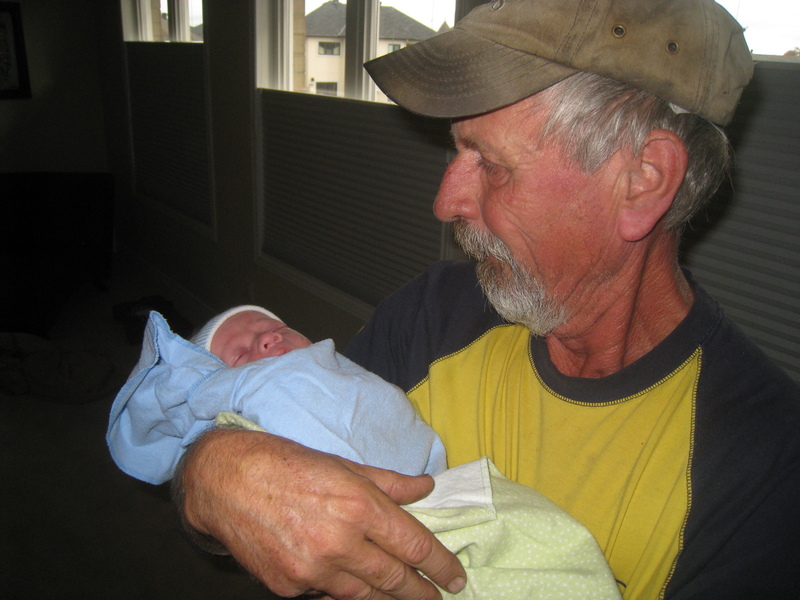 It was a happy meeting with Tristan holding his little brother and the proud grampa being overcome with his joy. Tristan went to bed an only child and woke up the next morning a big brother. Despite the fact that Tristan’s room shares a wall with ours, he didn’t wake until 8:00, 19 minutes after his little brother was born. The details really do have a way of working themselves out! I called my mom to let her know that Logan had arrived (grampa had let her know but didn’t want to spoil the gender surprise) and laughed when I found out she was parked behind our house (im)patiently waiting for the call to come over! … And a new life begins! Welcome to my new son, baby Logan. Mama loves you. 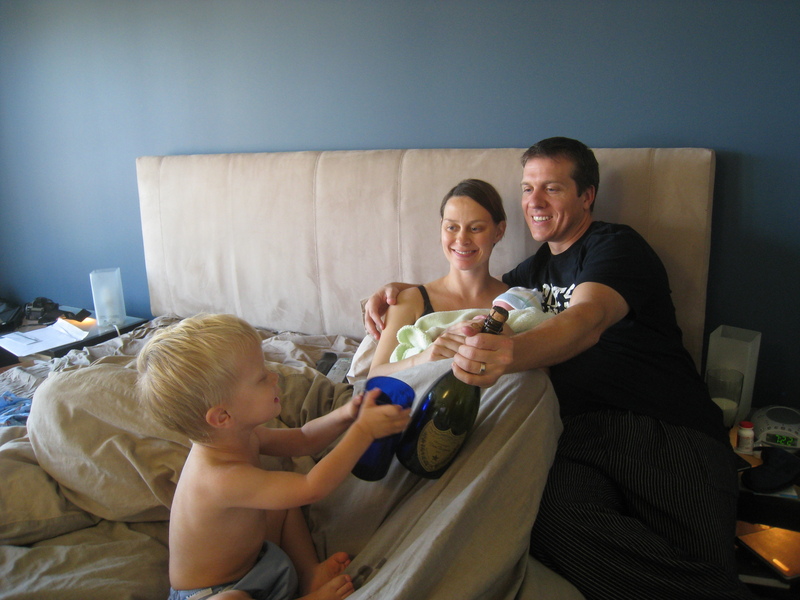 This entry was posted on November 10, 2010 at 9:58 am and is filed under Motherhood. You can follow any responses to this entry through the RSS 2.0 feed. You can leave a response, or trackback from your own site. Your story made me cry! You are so patient and calm, I don’t think I can be that calm on a good day let alone in labour. Welcome to the world baby Logan, I can’t wait to come and meet you.